Click here to view and download the handout "BILLS TO FOLLOW IN THE 2019 VIRGINIA GENERAL ASSEMBLY"
This flier was created for the Jan. 12 Virginia Prison Justice Network rally by Virginia prisoner R. Fentress. Please share it - and remember that those behind bars are much more than numbers. They are our sisters and brothers, with hopes and dreams and challenges just like the rest of us. They are artists and poets and thinkers and leaders. And if this were a just and humane system that didn't grind up humanity in the gristmill of profit making, they would be out here on the streets helping to make this a better world. The prisoner-led Virginia Prison Justice Network (VAPJN) was founded after the very successful Rally for Prison Reform held Jan. 20, 2018, at Capitol Square in downtown Richmond. 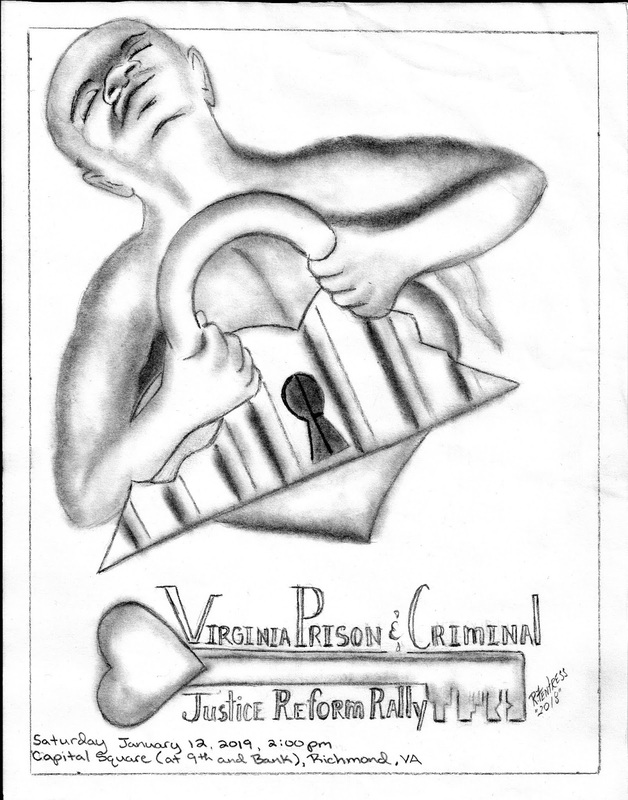 After a year of organizing that included three public Speak-Outs, in Hampton, Roanoke and Richmond, the all-volunteer network has grown to 15 affiliated organizations with a website (vapjn.wordpress.com), a hard-copy newsletter read by hundreds of prisoners and a string of victories in supporting prisoner-activists. Now we're preparing to intervene in the 2019 Virginia General Assembly, supporting bills that would improve the lives of our incarcerated sisters and brothers and opposing those that would not. To draw public attention to these issues, we held our second annual rally on Saturday, Jan. 12, again at Capital Square, by the Bell Tower. We will continue to amplify the voices of prisoners and their families as they call for long-overdue legislative reform, provide an opportunity to hear the stories of mass incarceration and learn how people can get involved in creating real change. If you care about Justice, and even if you couldn't join us at the rally, please help spread the word about these issues by sharing this page, and #vapjn with your Facebook friends! See the link at the top of this page for the handout "Bills to Follow in the 2019 Virginia General Assembly."